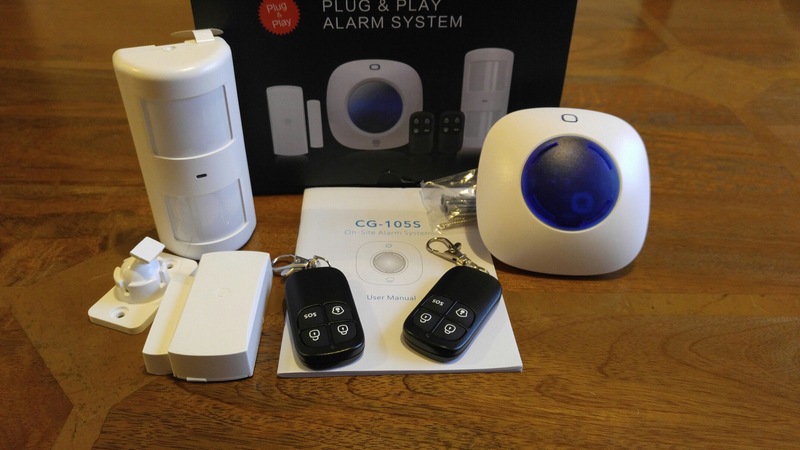 Welcome to my review of the miGuard Response A105 Wireless Plug and Play Alarm system. I was looking at the various options on the market and decided to take a closer look at the miGuard A105 starter kit as it seemed to tick all my requirements and was priced reasonably at £69.99. It also had the ability to be expanded which was a key feature for my circumstances. In other words, everything you need to get you going is included in the box. So how does it all work and function? Answer very easily but let me explain. The WS 105 Alarm Panel receives and processes signals from all the other components. Apart from those included in the box, you can add up to 40 wireless accessories. I really like this aspect of the system. The Alarm Panel is the device on the right side of the photo with blue plastic in the middle. If the alarm panel is triggered it sounds a loud alarm noise and the strobe light flashes. It is powered by AC 100 – 200V simply by plugging it in to the wall socket. To operate you just press the button on located on the front. Press to arm or disarm accordingly. The PIR-910 Pet Immune motion detector works off 2 AA batteries. It features an intelligent passive infrared motion detector, designed to detect humans within 0 to 8m. It also features a fuzzy logic to minimise false alarms. I have dogs so wanted to see how this worked with them. The specs state that pet immunity is for small animals up to 25 kgs. It worked with the 2 girls but George is much bigger and he triggered the alarm. To aid fitting the detector a wall bracket is provided which includes a ball head to help position correctly. The DWC-102 Wireless Door/Window contacts are fairly self explanatory. The two pieces work using magnets and when the magnet is moved away it transmits to the alarm panel. Double sided tape is provided too for fitment. This detector used 1 x AA battery. Finally the whole package is rounded off with 2 remote controls. These allow you to arm, disarm, activate SOS and Home Mode. Home Mode is available when you are using zones and means all the detectors are active except for the Home zone area. The SOS button is pressed twice switches to home mode and turns the nightlight on as well. The included user manual is excellent and provides lots of detailed diagrams and instructions and how to correctly install and position all the detectors plus explains all the extra options. For a beginner, it is simply and plug and play system, but with the ability to expand the system onwards and upwards it can become quite a mighty piece of kit. The miGuard A105 DIY Alarm system has proven to be reliable and simple to use piece of kit and therefore is recommended by me. It would be great to see some photos of this in situ. Also, is there a delay on the alarm to allow deactivation? I was thinking of a PIR on my rear home doors and a contact on the front door however I can’t have the alarm going off as soon as contact has broken. Also, does it beep when it’s armed or disarmed?